Rogen. Franco. Pineapple. Tarantino. Ninjas. This ad in The New York Times makes me unreasonably, but not unaccountably, happy. Who would have thought, only a year or so ago, that a major studio summer picture could be promoted with those (half-) faces and last names? Like: Pacino. De Niro. Or: DiCaprio. Crowe. What more do you really need to say? 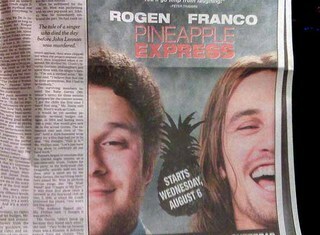 The title will be a mystery to most people until they see the movie, but it should already be clear to everyone by now that "Pineapple Express" is the greatest movie ever made. Tarantino's movies are, above all else, about one thing: What if? As in: If I, Quentin, were watching a movie, what would I really want to see? What would be the coolest things that I could recreate (call it an hommage), or improve upon, or put in a new context, or turn upside down and inside out? They're movies dreamed by video-store clerks who are destined to become acclaimed directors. "Harold and Kumar Go to White Castle" chronicles the quest of the titular pair to satisfy their munchies at the Holy Grail of burger joints. (Because there's no In-'N-Out on the East coast, a sad indication of the area's cultural inferiority.) It is a stoner's nightmare, and a stoner's wet-dream (in the sense that most dreams -- whether nightmares or fantasy-fulfillments -- seem to involve an element of delay or frustration before the payoff). 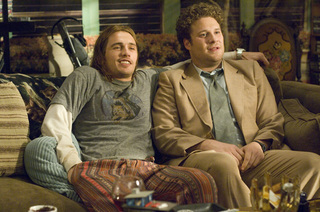 "Pineapple Express" is the movie that Rogen and Franco's characters, process server Dale Denton and dope dealer Saul Silver, would have hazily brainstormed while sitting on Saul's couch, smoking a fattie. Pot-fueled from start to finish, it's appropriately goofy, ecstatic and paranoid. It's the movie that... I forgot what I was going to say. No, it's like that one Godard quote again, from the movie about guys and chicks: "Pineapple Express" is the movie they want to make and secretly want to live. And not even secretly. So, it's an action movie, a cop movie, a gangster movie, a chase movie, a conspiracy movie, a drug-deal-gone-bad movie, a Ninja movie, a bromance, a hot high-school girlfriend movie (is that a kind of movie? ), a Tarantino movie, a Jackie Chan movie, a Judd Apatow movie... All it's missing, really, is R-rated T&A, but they may have been too stoned and forgot before it got to that part. Then it culminates with a breakfast scene. Is there anything greater than a big, greasy breakfast after a big night out, when you can recount and embellish everything you did the night before, shaping and solidifying it into personal legend? You were the heroes, remember? But you were also total f-ups, but it was hilarious, and you somehow squeezed out of it. And you swear to be blood brothers for the rest of your lives. And then your grey-haired Bubby (is there any other kind?) shows up to give you a ride home. I'm starting to tear up now. Best of all, the whole conceit is never explicitly acknowledged in the movie. There's no cut back to the guys who've fallen asleep stoned on the couch in front of the TV, waking up and realizing that they've spun the entire thing in a delirious Pineapple haze. It's just there, and you know it, because you can see it right in front of your face. Maybe I said this before, but you know how certain bands or certain songs -- maybe the Stones doing "Monkey Man," the Pixies doing "Debaser," the Replacements doing "Can't Hardly Wait," Nirvana doing "Lithium," Outkast doing "Hey Ya," the B-52s doing "Rock Lobster," whatever hits you at a particular time and place -- can be the best band and the best song in the world right then and there? While I was watching "Pineapple Express," I wanted to believe that it was the greatest movie ever made, if only to justify to myself how hard I was laughing, and it didn't matter if I knew it wasn't because, for those moments of course, it was. P.S. Franco gets an Oscar nomination or the whole thing is a farce.